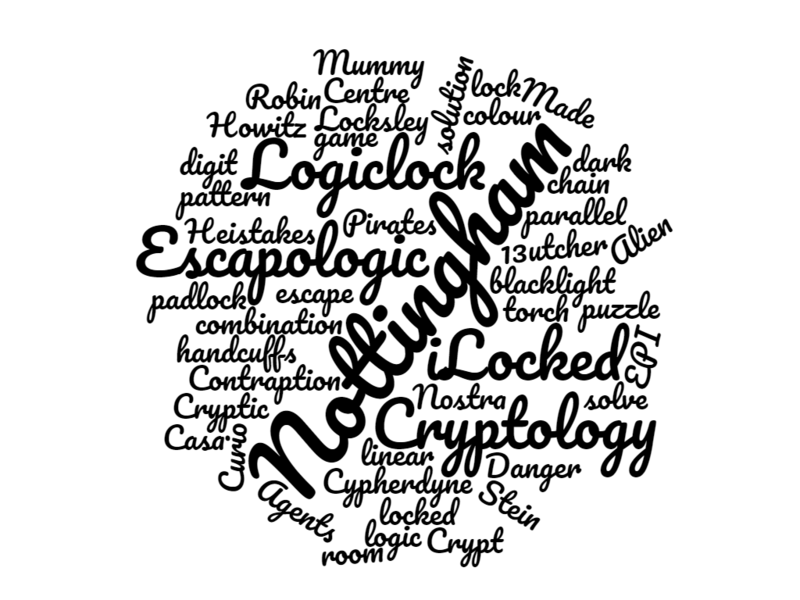 In January 2017, we spent a weekend playing escape rooms in Nottingham. The best games in the UK are spread pretty far and wide – from Bournemouth to Edinburgh – and only three towns really have a reputation for having lots of good games: London, Edinburgh and Nottingham. Fortunately, with only 12 games at the time of playing, it was a simple task to choose which ones we played: all of them. Since then, four more games have opened and you might struggle to fit them all into a single weekend if you want to stop for meals. Those new ones have obviously not been reviewed, but I’ll include them in the lists below. When you’re picking out what to play, it’s also worth considering popping over to nearby Derby. While I’ve never played the games there, some of them come with a stunning reputation. At the time of writing, Nottingham has the following games – I’ve included links to the reviews of the ones that I’ve played. If you’re only going to play one game, then there is absolutely no doubt in my mind that you should choose Curio. It’s a stunning game with plenty to offer and represents some of the most amazing set design that I’ve seen. Of the Escapologic games, it also has the best puzzle content, in my opinion. If you’re looking to play several games in a single venue, then I would again direct you to Escapologic. One of the most interesting things about our weekend was that most people had a very different view for their second favourite room. If you like some horror and adrenaline rush, then 13utcher will appeal. If you want to play around with gadgets, then Contraption delivers on its name. For fans of chunky physical interactions, I’d suggest EPI Centre. Want a sense of adventure and exploration? Then Cryptic will appeal. The biggest issue with Escapologic for me is that their games aren’t automated – they rely on the GMs to trigger things. That takes a little bit of the magic away, although it does mean it’s less likely that you’ll encounter temperamental mechanisms. If you do want high-end, automated rooms, then iLocked have one of the most high-tech games that you’re likely to encounter and, since writing my review, they’ve changed one of the most frustrating parts of the rooms. I expect Alien to be right up there too. Logiclock has a decent set of games but they look relatively plain in comparison to the two companies above – Casa Nostra was my favourite and, in isolation, is a good room. Cryptology has a long-standing reputation in the city, but we were a little underwhelmed by the experience. If you head along, then I’d suggest the Crypt as the better of their two rooms: a little more immersion and less suggestion that the puzzles had been shoehorned into the game. If you’re a true addict, though, then head along, play all twelve (now sixteen!) rooms, and I don’t think you’ll be disappointed in your overall experience.